After the success of my Edible Slime made with Lifesavers Gummies, I figured it would be fun to make another edible slime. 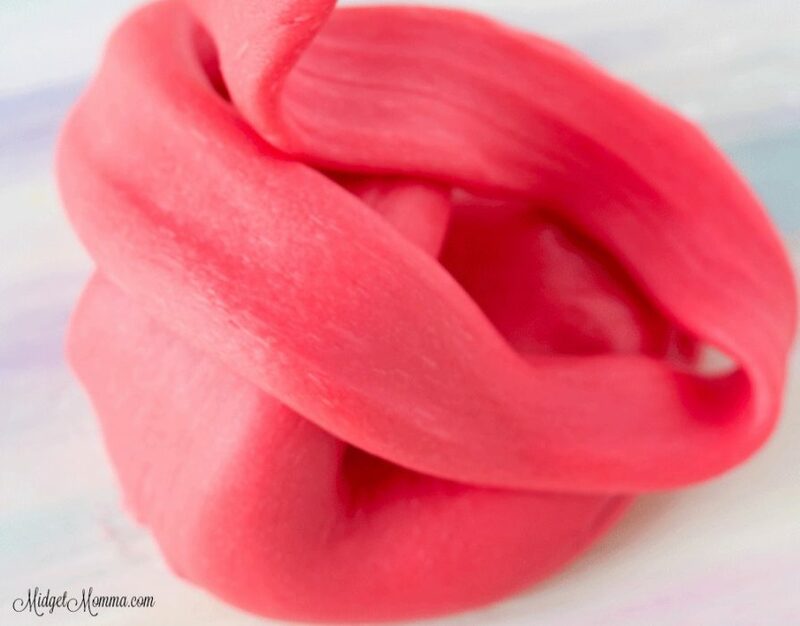 This easy edible slime is another one the kids love! This time I used Starburst candies to create this Edible Starburst Slime. 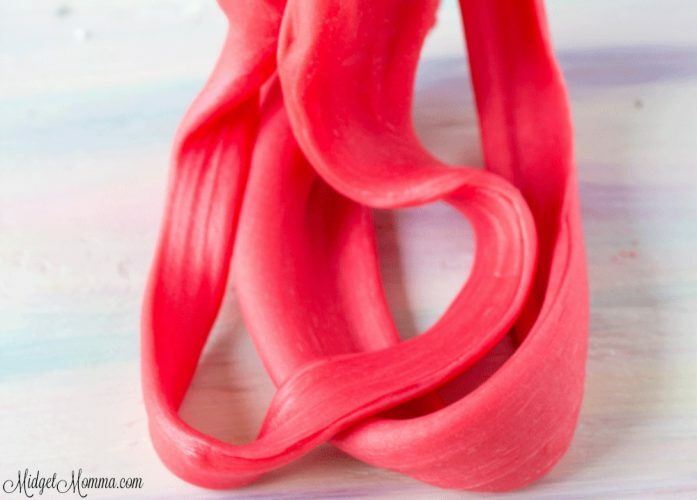 This Edible Starburst Slime is a little more difficult to make then the gummy lifesaver candies because it is a harder fruit chew but it is not totally complicated to make and still a TON of fun! Instead of just melting it in the microwave, you need to use a double boiler to melt this candy. If you trying to microwave with this candy it will burn instead of melt. 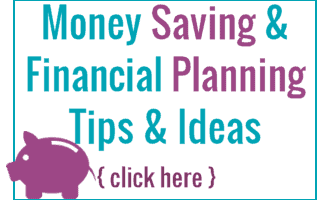 Check out how to make your own double boiler using a heat safe bowl and a pot of water. You can make this edible starburst slime recipe any color by dividing up the colored starburst and make sure you melt all the colors separately. You don’t have to do this stuff but, it will save time when making your edible Starburst Slime! Use the Starburst Minis to skip having to unwrap them. Make sure you have 14 ounces worth for this recipe to work, so you will have to weigh it. Use the Starburst Minis FavReds when making red because all the colors will blend together to make a red starburst slime. To help the candy melt easier I used a pair of kitchen shears to cut the candies into quarters, the smaller starburst pieces melt easier. In a small bowl mix together the cornstarch and powder sugar, set it aside. Unwrap all of the starbursts into a medium heat safe bowl. Using your kitchen shears cut each candy into for equal piece. Place half the starburst into another bowl. Place the first bowl over a simmering pot of water. Keep stirring with a rubber spatula until all the candy is melted. Pour the cornstarch mixture on your counter and put the first batch of melted starburst on top, allow to cool while you melt the second batch of candy. Knead both of the melted starbursts together in the cornstarch mixture until the mixture is not sticky. When you would like to play with it after it’s been sitting around you will need to soften it up in the microwave for 30 seconds and re-knead it. When making this edible slime recipe with starbursts, you can make all of the colors in the bag, you will just want to make each one following the directions above for each color. 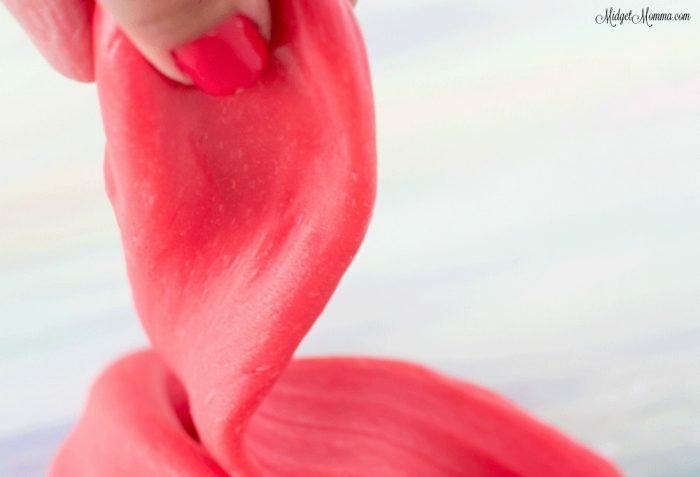 If your slime is sticky, use a little bit of olive oil or coconut oil to make it less sticky. You can add more powdered sugar if needed as well to make it not so sticky. If you are looking for a slime recipe with out glue, this is the perfect slime recipe to make! Looking for more edible slime Check these out! Looking for Even More slime? These are a few of our favorites! Looking for even MORE fun with the kids? Check these out!